A gentleman with a neatly trimmed beard stands at the counter of an Arcata business on a weekday morning and asks the clerk for an eighth of an ounce of Trainwreck, a popular strain of sinsemilla marijuana. The young woman on the other side of a glass partition, who looks to be a typical Arcata college student, reaches under the counter and produces a bag of fresh green buds. She pours a portion into a paper cup set on an electronic scale, then carefully transfers it to a plastic bag.As she does so, the customer asks questions about other strains available. He’s looking for some variety. He ends up buying small bags of several different kinds, paying the going rate — $40 per eighth of an ounce — with a handful of $20 bills. Variety is definitely something the Humboldt Cooperative (popularly known as THC) has in spades. A display behind the glass shows an array of 20 varieties of sinsemilla buds available to those with the proper doctor’s recommendation. A dry-erase board above them tells whether the individual variety is a sativa strain, an indica strain or a cross. The counter also holds a row of small, colorful, hand-blown glass jars for sale, along with copies of an autobiography by Grateful Dead bassist Phil Lesh. A bulletin board on one side of the entrance is crowded with fliers for rock and reggae concerts. A framed poster on the other side of the door shows a Native America smoking a peace pipe. The overall feel of the place is more akin to a crowded little head shop than a doctor’s office or pharmacy. But this is a head shop hippies in the ’60s only dreamed about, one where the sale of pot is legal — at least under state, county and city law. This is an officially sanctioned medical marijuana dispensary. A billowing cloud of controversy surrounding medical marijuana has made it the hot topic du jour in Arcata. Last month, after an indoor medical marijuana growing operation burned in a rental house, the subject jumped from the front pages of local newspapers to the City Council chambers. City staff from the planning, fire and police departments had been chewing on the perceived problem at weekly confabs for over a year, but the house fire moved the issue to the forefront of public debate. Richmond then turned the mic over to his colleague Vincent Feliz, a pony-tailed drug and alcohol counselor from the university who said he finds it “scary” that Humboldt regards marijuana culture in such a “complacent” manner. It’s true, there’s gold in those green buds. How much is anybody’s guess. Since 1996, when California voters passed Proposition 215 and legalized marijuana for medical use, the drug has slowly been working its way out of the shadows. There’s still not much data on the marijuana trade — almost none on the black market side and precious little on the medical marijuana gray market. That said, according to a report in The Economist magazine last month, pot is California’s biggest cash crop, surpassing grapes. Everyone agrees, it’s a lucrative business. And that fact might make things difficult for those who, like Richmond, oppose the ever-expanding marijuana trade in Humboldt County. In Arcata, at least, some high-powered members of the business establishment are getting their taste of the proceeds. So is the public. It’s not just the problems of the marijuana trade in the City Council’s lap — it’s the profits, too. It’s not news to anyone that plenty of legitimate businesses are thriving off the marijuana gray market. Examples? Take a look in the new phonebook and you’ll find a dozen or more hydroponic supply businesses. Know anybody who grows hydroponic tomatoes or lettuce? But with medical marijuana becoming more and more mainstream, even straight businesses are getting their cut. 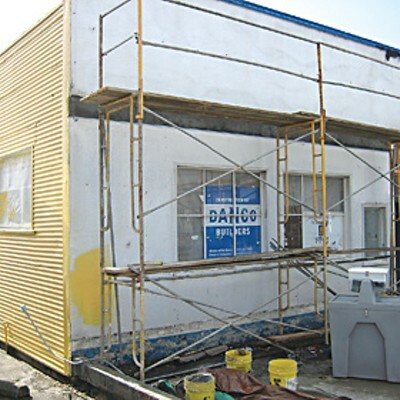 One such business is the Danco Group, Arcata’s largest contractor and real estate company. 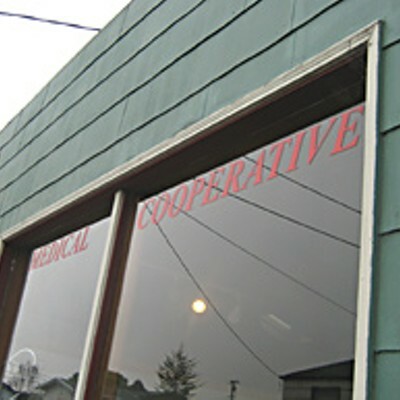 The Humboldt Cooperative is only one of four medical marijuana dispensaries in Arcata. Danco is currently landlord to two of those dispensaries, and it’s building a brand-spanking-new facility right off the Arcata Plaza for another of them. You’ll also see the Danco name in the window of the former P.C. Sacchi Chevy dealership next door to the Arcata Post Office, immediately off the Arcata Plaza, which is currently being remodeled. Soon the Sacchi building will be home to Humboldt Medical Supply (HMS), a medical marijuana clinic currently located in a hole in the wall office on Eleventh Street. HMS’s plans will feature an “intake area,” where patients will be able to purchase their marijuana, as well as a large growing operation. The Sacchi property belongs to JBL Plaza Associates, a partnership between three prominent local businessmen — “J” for Dan Johnson of Danco, “B” for local realtor Mark Burtchett and “L” for Paul Lubitz of Holly Yashi Jewelry. In an e-mailed statement, Danco spokesperson Lindsey Myers emphasized that all the facilities strictly comply with the law. “In the case of the Sacchi building, Danco Builders has been hired to build a new space for HMS,” she wrote. “All construction is specific to the intended use and according to Uniform Building Code.” As for the businesses in the Isaacson lot, Myers said that the marijuana operations there carry insurance policies and have promised not to engage in “illegal” activities. “They are commercial tenants and we manage their leases just like any other commercial tenant,” Myers wrote. Myers declined to give exact figures, but she said that Danco’s rental rates for the three dispensaries are comparable to other commercial properties in the city. The city of Arcata has been intimately involved in the project underway in Danco’s revamped Sacchi building, which will also host a new Rita’s Mexican Restaurant, next door to HMS. The restaurant side will have to undergo a long series of inspections with everyone from the building and health departments to the fire marshal making sure all systems meet strict institutional standards. There will be far fewer hoops for the dispensary, as there aren’t established standards specific to facilities for growing, processing and distributing marijuana. As Arcata Community Development Director Tom Conlon explained, all that’s required at this point is a business license and a building plan that meets building code regulations. There was one element of the HMS building design that Conlon’s department weighed in on. 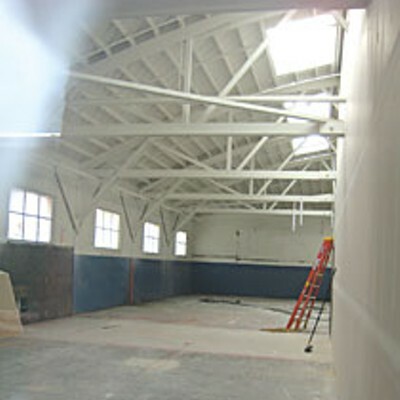 According to Conlon, an early draft of the layout for the business indicated that the majority of the space would be used for a growing operation. That goes against a provision of the code for businesses in the downtown commercial district, since the grow is considered a manufacturing use. Regulations call for less than 50 percent of a building’s floor space be used for manufacturing operations. The designs were revised accordingly. Perhaps it’s appropriate that the majority of medical marijuana dispensaries in Arcata will soon be located in the town’s old auto dealerships. Once upon a time, those businesses were among the biggest contributors to the city of Arcata’s budget. They took in plenty of cash, and so passed on a great deal of sales tax revenue to the city. Now, reinvigorated with marijuana dispensaries, those old buildings have the potential to once again make a substantial contribution to the city’s bottom line. 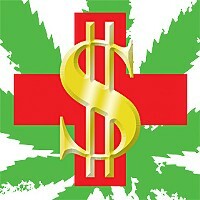 There’s a common misconception when it comes to the medical marijuana trade. Probably because the business has its roots in the black market, most assume that no one involved pays taxes. The question came up in passing when the Arcata council was deliberating on medical pot issues. 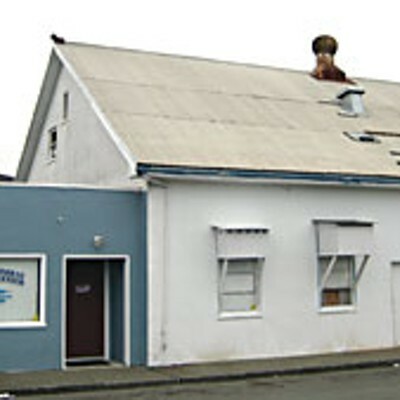 When discussion turned to a proposal to cap the number of dispensaries, Councilman Paul Pitino brought up a salient point: He’d noticed that one of the dispensaries, the Humboldt Cooperative, was listed as “one of the largest sales tax payers in Arcata,” in a recent city report on tax contributions. “Are we going to arbitrarily limit something that’s funding the city?” he wondered aloud. Dennis Turner of the Humboldt Cooperative is proud of the fact that his business pays its taxes. He’s owner of what he claims is the largest dispensary in Arcata — and by extension, in Humboldt County, since there are currently no dispensaries outside the Arcata city limits. Turner told the City Council that the Cooperative serves 5,200 patients and buys from “over 80 growers.” That’s on top of the product that the Cooperative grows at its Isaacson’s facility. “We got a state of California sales permit the day we opened,” he noted in a recent interview. He claimed that his was one of the first dispensaries to do so, and that his letters to the state Board of Equalization helped inspire that agency’s decision to establish an official system for collecting taxes on medical pot. That’s right — it’s not just sales tax that’s paid by those associated with the dispensary. The growers pay income tax too, at least some of them. As Turner spoke with a reporter at the co-op, a dispensary employee interrupted to say that a grower has come in who needed to fill out his 1099. The young man, clean-shaven with close-cropped hair, stood on the other side of the glass. A digital photo identifying him was displayed on a computer screen on the counter. An office worker in the back produced a form, the grower filled it out, the transaction went through and was duly recorded. At some point a quarterly report will be sent to the IRS regarding the sale. He admits that some growers balk at the prospect of reporting pot income to the IRS or having income tax withheld — they take their business elsewhere and don’t return. For his part, Turner says he’s been waiting for the city to get around to addressing the issues surrounding dispensaries and grow houses. “It’s been a long time coming,” he said. “You need rules. You need standards. You need parameters for these places. “This is what I call ‘gray zone programming,’” he said, echoing a recurring theme regarding regulation of medical marijuana. With 215 and 420, much is left to interpretation. There’s not much black and white. “If we don’t regulate we’re going to lose out. When I started this, I wanted to bring accountability to medical cannabis. Remember there were no rules and regulations for any of this at all,” which meant the operators have had to make up their own rules. At its Oct. 17 meeting, the Arcata City Council set up a “medical marijuana working group” to study the medical marijuana industry in Arcata, and to devise policies to limit its negative impact. And though the working group has yet to meet, city officials are already thinking about how to tackle the problem. Where will the council and its working group take the issue? It’s hard to say, but everyone agrees that Proposition 215 is here to say. And there seems to be a consensus that the city should get more involved in the marijuana trade by encouraging growers to limit operations to the city’s commercial and perhaps industrial areas. Community Development Directory Tom Conlon won’t be around to see the fallout — not as a city employee, anyway. He’s set to retire before the end of the year. But he still has some ideas on potential parameters. 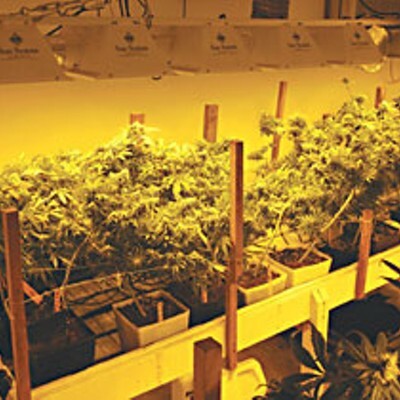 As far as other standards regulating grows, Conlon would just as soon see Arcata set them far stricter than the county guidelines, which allow for 100 square feet of growing space and three pounds processed marijuana. He’d rather see the city use the state’s minimum: six mature plants and eight ounces of processed pot. It may be worth noting that Conlon’s interest in this issue may extend beyond his employment by the city. As he intimated during a break at one of the council meetings last month, his home in the Arcata hills is between two grow houses. For the most part, Arcata Police Chief Randy Mendoza has been quiet when it comes to medical marijuana. But he does have his own opinions on where he’d like to see things go. “I hope the city will come up with an equitable plan that will restrict the location of large grows to specific areas, that they are limited to the central business district where they belong,” he said. Vice Mayor Mark Wheetley has been studying the issue, looking primarily at the public safety angles. As to residential grows, he definitely favors standards that discourage conversion of entire houses for production. There wasn’t much talk of the financial impact of the business of producing and selling marijuana at the city’s Oct. 17 council meeting. An exception was a somewhat disjointed speech by Steve Gasparas, owner of the city’s fourth marijuana dispensary, the Arcata iCenter. Clad casually in a hooded jacket and ball cap, he addressed the council after President Richmond and Vincent Feliz and disputed their suggestion that Humboldt County’s association with marijuana is a negative thing. On the contrary, he sees weed as a boon to the local economy, something that should be encouraged. It’s not likely you’ll find everyone in the business community signing on to that way of thinking, but there’s no denying that there’s a seed of truth in what he says. Like it or not 215 is here to stay, and so is the money that comes with it.